visit a lady who is in confinement (ie within one month of giving birth). postponed till 3 years (1000 days) after the death. Note: Mourners engaging in entertainment and social activities such as weddings, birthday parties, festive visiting are considered being disrespectful to the deceased parent. 3. It is preferred that no one sleeps or sits on the bridal bed after its installation and blessing for fertility. If however, the groom needs to sleep on it before the wedding he should be accompanied by a young boy preferably born in the year of the dragon. To leave one side of the bridal bed empty is considered a curse on the health of the couple. 4. If the bride meets another bride on the wedding day their luck may clash. 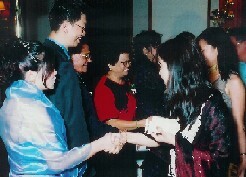 The matchmakers or the bestmen from the two bridal parties will exchange red packets on the couple’s behalf to neutralize the effect of the clash. 5. Persons born under horoscopes that clash on the wedding day are not invited as bridesmaids and bestmen, or invited to the wedding day activities. However, they can attend the wedding banquet. 6. To avoid clashing with the bride’s luck, everyone in the groom’s home will hide to avoid the bride when the couple enters the groom’s home for the first time. They will return to the living room when the couple has entered the bridal room. 7. Persons in mourning are not to attend any celebrations and entertainment within 100 days of the death as a form of respect for the dead. So they will not attend any wedding celebrations. 8. 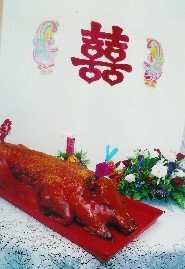 If a roast pig is included as part of the bride’s home visit gifts, be careful not to break the ears or tails accidentally. An imperfect roast pig implies that the bride is not a virgin. 9. Even numbers are used for joyous events. All red packets should contain even numbered amounts. 10. White, blue, green are mourning colours and should not be used for wedding decorations. 11. Pale yellow or white chrysanthemums floral arrangements are used at funerals or at visits to ancestral graves and should not be used for weddings. 12. 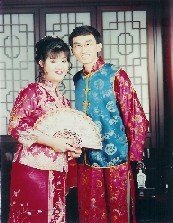 In the past, chinese believed that the bride and groom should not meet each other the day before the wedding. However, this taboo is no longer strictly observed. The bride and groom will usually meet up on the day before the wedding to finalise their wedding arrangements and collect the bridal gowns, suits and flowers, etc. The taboo is now observed in a modified manner; the bride and groom will not sleep under the same roof the night before the wedding. Share a chinese wedding taboo with us? Do you know any other chinese wedding taboos you will like to share with us?